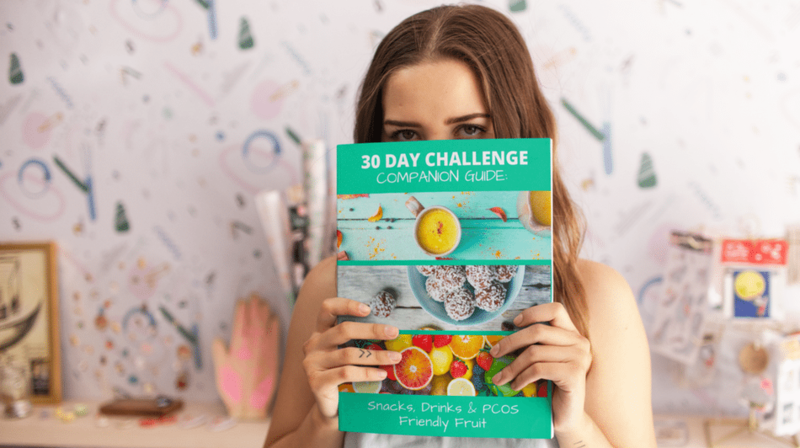 There are hundreds of ways to be derailed from your health goals, but during my free 30 Day PCOS Diet Challenge we’re going to punch through all of them. Like any great journey, a good guide can make all the difference and this comprehensive ebook is exactly that. Throughout the Challenge you’ll be assigned daily activities and the workbook section of this Guide provides a dedicated place you can complete them. You’ll unearth the motivating factors that can sustain you over the long term, you’ll assess the risk factors that are mostly likely to stand in your way, and you’ll develop creative ways to overcome these barriers. This Challenge Companion Guide is the perfect repository to keep this valuable information long-term and refer back to. 17 PCOS friendly snack recipes including my highly rated Choco Nut Balls and my popular chip substitutes. 13 PCOS friendly drink ideas including my special DIY Protein Powder and some of my favorite smoothie recipes. Using one of the most comprehensive nutritional databases available, I’ve also assessed the total metabolic fructose content of 40 different fruits to bring you my fresh fruit recommendations for the 30 Day Challenge. This information is NOT available anywhere else. You can still enjoy snacks, drinks and fruit while beating PCOS, you just need to do it smarter. This low-cost Guide will show exactly how.